Thoroughly rinse rice. Place in a pot and cover with water. Set on medium heat. When water starts boiling, start stirring. Keep stirring and adding more water until almost cooked. Stir in the coconut oil and cocoa powder. Then, add in the honey or maple syrup, salt, cinnamon and vanilla, mixing well. 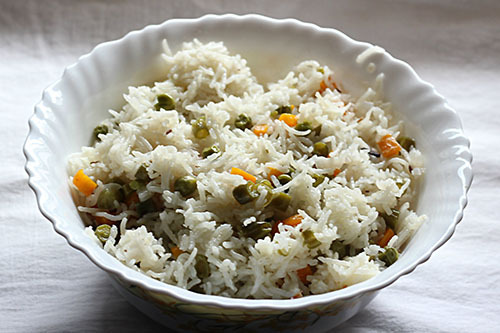 Turn stove on low and simmer until rice is cooked. Wash and drain rice. Set aside. Chop the white bulbs of the scallions. Keep the green part aside. Heat a tablespoon of coconut oil in a pot / saucepan. When the oil is hot, add cumin seeds and turn the heat to low. Add ginger and the chopped scallion bulbs and sauté until the scallion browns slightly. To this add the washed rice and sauté for a minute. Finally add coconut milk, lemon juice and the salt. Bring to a boil, reduce heat and simmer covered for 15 minutes. While the rice is cooking, chop the green part of the scallions. After 15 minutes, turn off the heat. Let it stand covered for 5 more minutes. Remove the lid and fluff rice with a fork. 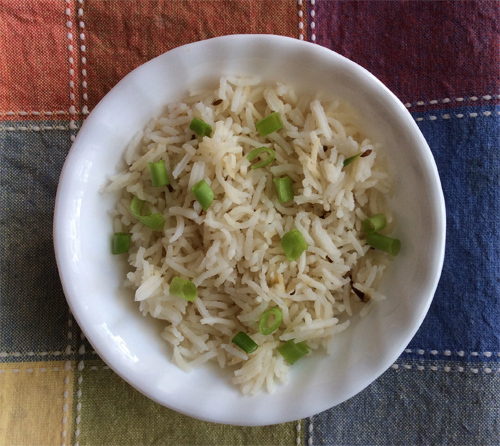 Serve the coconut rice in a plate garnished with the chopped scallion greens. 1. Cut up your chicken into small cubes (Â½ to 1 inch pieces). 2. In an 8 quart enamel cast iron pot (or wok), add your coconut oil, onions and chicken. Sprinkle with a layer of salt. Cook on medium-high heat until the chicken is thoroughly cooked. Add the garlic and ginger as the chicken is cooking. Note: If your onions are fresh (not frozen), then cook those down for about 4 minutes first, then add chicken. 3. Add frozen vegetables. Sprinkle a little salt over the surface again. Cook on medium-high heat until the vegetables are warmed through, about 10 minutes, sometimes covering the pot with its lid. While the veggies are cooking, crack all of your eggs into a bowl. 4. Push the pot contents to one side as best you can. Add the eggs to the emptier side and let them cook, scraping the cooked portions from the bottom. Season with a little salt and pepper as they cook. They will likely take about 5-10 minutes to completely cook. Once the eggs cook completely, incorporate them into the chicken and veggies. 5. Add your cooked rice, soy sauce and sesame oil. Stir to completely combine. Done! 6. Portion out your servings and top with chopped green onions and sesame seeds, if desired. Left-overs reheat beautifully on the stovetop. Just add a little water to the bottom of the pan. Recipe can easily be cut in Â½ or quartered for desired servings. You can omit chicken breasts on nights when you 1. don’t have any or 2. need a quicker meal. I buy my organic onions in bulk. I dice many pounds all at once in a month and freeze them for quick access and faster cooking times. Tamara from Spring, TX just won $50 for this recipe and photo! Submit yours here. Cook chicken in coconut oil in skillet. While chicken is cooking, place all remaining ingredients in a blender and blend just until smooth. Pour into a saucepan on medium heat and bring to a boil. Add cooked chicken to broth, salt to taste. Serve over rice or pasta. Because February is the month of chocolate (and that other thing) I wanted to come up with a recipe that was both insanely rich, chocolaty, and gluten free, so no one gets left out and grumpy. 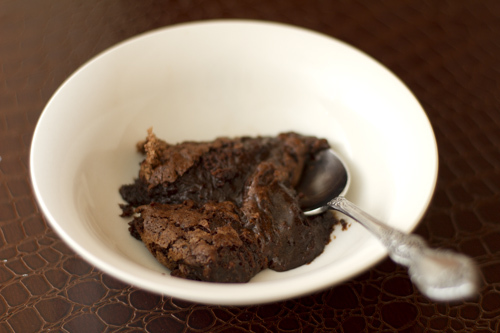 This brownie pudding took me a few tries to get just right. The first time it turned out to be more of a soft, and very fudgy brownie that had a little too much butter. Not bad, but not at all what I wanted. It was gone by morning. I’m still not entirely sure what precisely went wrong (probably more than one) but I blame the tap water, which burns with the heat of a dozen tiny volcanoes. Basically, the water for the water bath was too hot, and the dessert baked faster than it should have. I debated on what to do on the next attempt, besides reduce the heat of the tap water to the heat of half a tiny volcano. It was indeed insanely rich, but was it too rich? The fact that it was so easily over-baked past the pudding stage means it’s pretty finicky, and finicky equals many failed first-time attempts, and many failed attempts means many grumpy people. No one wants that. With that in mind, I made the decision to incorporate the technique used to make pudding cake: boiling water on top of the batter. 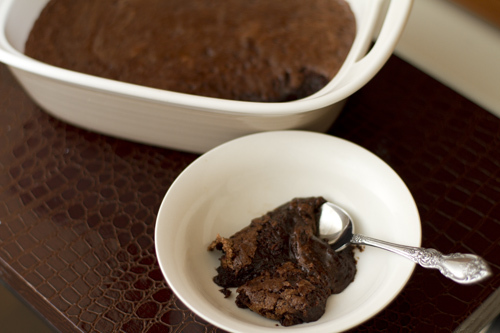 This would ensure that there would definitely be pudding, and less chance of over-baking the dessert into brownies (not exactly a bad result, but not what we want). The only potential con was that it wouldn’t be as rich. Nix that idea. What resulted was a strange pudding layer that didn’t stay in pudding form very long. Plus, the brownie part wasn’t as fudgy and smooth. I didn’t like it, and it did take longer than the first to disappear. Finally at the third try, I decided what the batter needed was more of a reason to stay custard-y, much like a flourless chocolate cake. That meant more egg. So with one extra egg added, baking time watched closely, and the water at the heat of half a tiny volcano, I gave it a third go. It was perfect. However, I attribute the success more to the water and the baking time; the egg is merely a luxury addition that acts as a safety net for the pudding texture. I know some of you absolutely hate using many eggs in a recipe. If you really must, 4 eggs will do. But if you can, don’t. Preheat oven to 350 degrees ºF. Grease a 2 quart baking dish with coconut oil. Melt butter over low heat. Set aside to cool. Mix flours together. Beat eggs and sugar with an electric mixer on medium speed until thick and slightly lighter in color – 1-2 minutes. Add cocoa, vanilla and flour mix. Mix well. Slowly pour butter in while mixing at low speed until well combined. Pour mixture into prepared dish, place into a 9×13 inch pan and fill pan with hot tap water to come about half way up the sides of the quart dish. Bake in preheated oven for 30-40 minutes. Edges should be firm but middle should jiggle and look very underbaked. Cool and serve with freshly whipped cream, ice cream or as is. Chop the whites off of the onions and set the greens aside for the soup. Finely chop 1/2 cup of the mushrooms and save the rest for the soup. 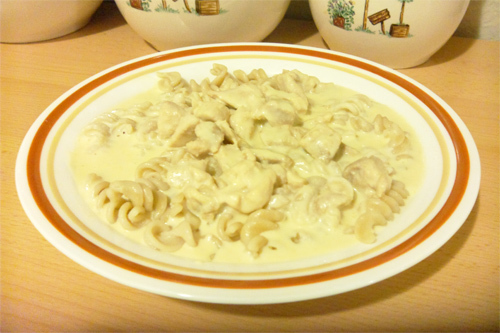 Combine the chicken, egg, chopped whites, chopped mushrooms, minced garlic and salt in a bowl. Form the meat into desired size meatballs and place in the bottom of the crockpot. 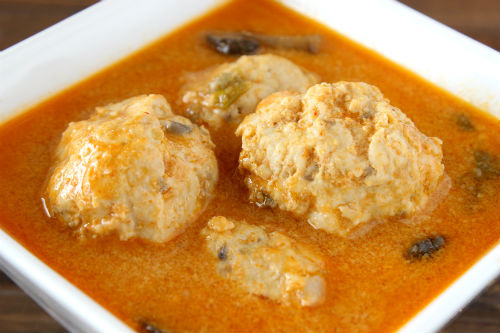 Combine the coconut milk, broth, soy sauce and curry paste in a mixing bowl. Add the remaining mushrooms and chopped greens from the onions. Pour over the meatballs and place the piece of ginger into the liquid. I imagine this will work in a soup pot or could also be cooked on the low setting of your crockpot for longer if need be. You could add some additional vegetables such as broccoli, red pepper and snow peas if you wanted to. It may not be as soupy, but still good!!! 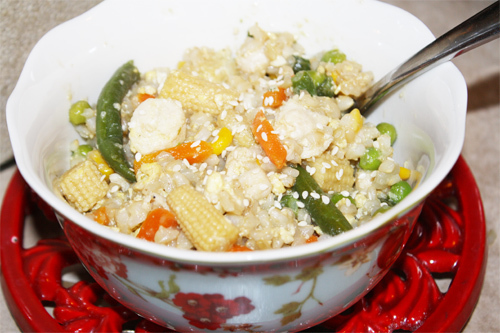 This would also be great served over cauliflower rice or white rice if you tolerate it. 1. Mix the tapioca & coconut flour in a large bowl. Add the other dry ingredients and mix well. 2. In separate bowl, whip the eggs well. Add the oil and water and mix. 3. Pour the liquids into the dry ingredients and mix until makes sticky dough (add more water as needed). Set aside in fridge to allow coconut to absorb liquids and oil to thicken to make dough more pliable. 4. For the filling, mix all liquid honey and butter first, then blend in cinnamon and more sugar to your liking. Set aside. 5. Preheat oven to 350 degrees °F. 6. Spread out the wax paper of plastic wrap. Sprinkle with flour to prevent dough from sticking. 7. Place dough in the center of the workspace. Flatten slightly with hands. Sprinkle flour on top to make dough a little less sticky. 8. Apply flour to rolling pin and roll out dough to a rectangular shape. 9. Spread the filling to the top of the flattened dough. Roll the dough carefully from one side to the other, using the wax paper to help lift and the coating flour to help separate. 10. 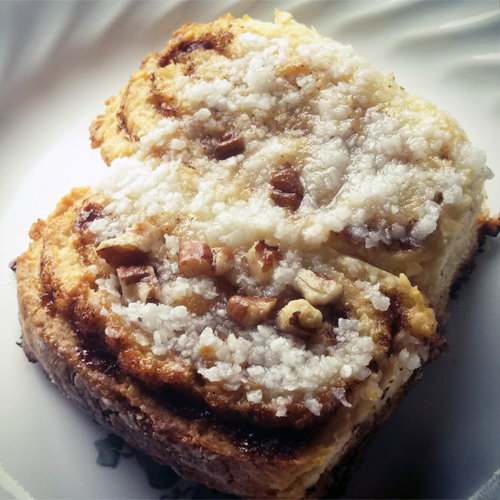 Now that you have a cinnamon roll log, cut it in half. Each half, cut in half again until you have 8 pieces. 11. Lightly dust a tall edged baking pan with flour, not oil. (I made that mistake with the first batch!) The flour helps the sugar not to burn and make bottoms crispy. Place rolls gently on baking pan and put in oven for 25-30 minutes. You can check the doneness by inserting a toothpick to see if it comes out clean. 12. Let the rolls cool for at least 5 minutes. 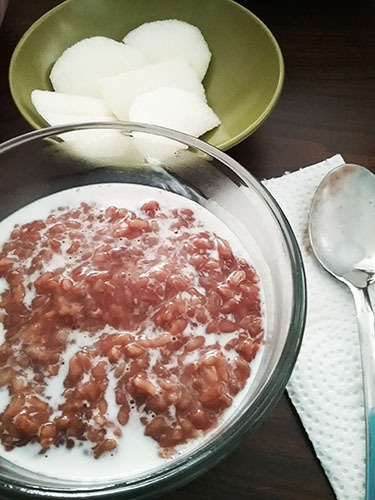 You can apply a simple icing, mix icing with coconut flakes and pecan pieces or syrup with butter or eat them plain. (Icing is made from mixing powdered sugar and milk/water).